Over the past decade online shopping has escalated at a phenomenal rate in the UK resulting in a demand for warehouse space which has nearly doubled. TYNE AND WEAR, England, March 20, 2019 /PRNewswire/ -- Between 2007 and March 2018, around 235 million sq ft of warehouse space was leased or purchased across the United Kingdom which is equivalent to more than 3,000 Wembley Stadiums. According to CBRE about 60% of this warehousing space is used by retailers, feeding the demand of online shopping. According to John Munnelly, Head of Operations at John Lewis: "Logistics is becoming the new retail". 65% of activity in logistics is retail driven. A greater shift towards online business means a greater demand and competition for cost effective 3PL storage space so companies can adapt to eCommerce demands and the demands of their customers. Rubb Buildings Ltd Managing Director Ian Hindmoor commented "Feedback from our customers suggests that they are planning for the future, to be able to maintain the flow of their production and fulfil the demand from their customers. 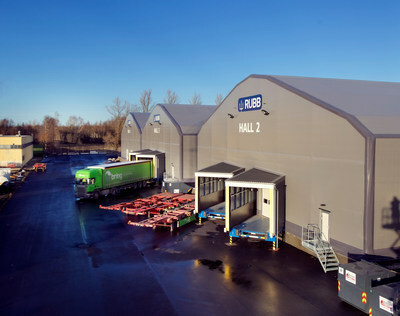 Rubb storage facilities provide an alternative and sustainable solution to traditional storage warehouses. To keep up with this ever-changing environment a semi-permanent fabric structure helps save on costs and is able to adapt to the changing requirements of the end user." Rubb Buildings Ltd is a world leader in the design and manufacture of custom made relocatable engineered fabric structures. Highlights include ground-breaking military buildings (aircraft hangars, shelters, storage facilities), specialist sports buildings and structures for a variety of sectors including aviation, ports, construction, bulk storage and environmental (waste and recycling). All products are designed and manufactured at Rubb's UK plant at the Team Valley Trading Estate in Gateshead, Tyne and Wear. The company was founded in 1977 and has a proud history of delivering innovative and quality structures to a wide range of clients. The Rubb Group also has plants in the USA and Norway.